Discover Cuba from a different perspective by exploring the highlights of the Western and Central regions by bike. Learn all about this unique country, its history and way of life whilst enjoying the rare opportunity to interact with rural Cuba. Start in Havana, the exciting and picturesque capital before travelling west to Las Terrazas biosphere and the dramatic scenery of the Viñales Valley. Swim in Cayo Jutias turquoise waters before learning about Revolutionary history at Che Guevara’s mausoleum in Santa Clara. Hike in the Escambray mountains, cool off in a mountain stream then head to Trinidad to soak up the atmosphere of Cuba’s best preserved colonial town. Cycle to the stylish town of Cienfuegos and then on to the historic Bay of Pigs. Head back to Havana via the Venice of Cuba, Matanzas, and the stunning beaches of Jibacoa. What’s not to love? Enquire for full details. A unique way to explore Western and Central regions of Cuba – from Havana to Las Terrazas biosphere and the Viñales Valley, the Escambray mountains, Trinidad, Cienfuegos, the historic Bay of Pigs and back to Havana via the Venice of Cuba, Matanzas, and the stunning beaches of Jibacoa. This trip takes in the highlights of Cuba’s vibrant capital, Havana, and its Western and Central regions. The terrain is very varied, ranging from picturesque coastal paths to quiet country lanes to dramatic mountain roads. In addition to Old Havana, the itinerary visits three other UNESCO World Heritage sites: the stunning colonial towns of Trinidad and Cienfuegos and the Viñales valley, famed for its world-class tobacco cultivation and prehistoric limestone landscape. The trip takes in key sites in Cuba’s Revolutionary history, including Che Guevara's Mausoleum in Santa Clara and the Bay of Pigs. The route is mainly flat or undulating and is great for both amateur and experienced cyclists. When off your bike there`s a wide variety of opportunities to learn about this unique country: visit a tobacco farm, walk in the Escambray mountains, stay in Las Terrazas Biosphere, listen to live music and relax on some of Cuba's beautiful beaches. Welcome to Cuba! You will be met at Havana airport and transferred to your start hotel. Relax and enjoy your first night in this fascinating city. Today enjoy a bike tour of Havana. Cycle through the well-to-do Miramar district, the Metropolitan Park and Plaza de la Revolucion. Continue past the mansions built by sugar barons in the early 20th century and down into the heart of the old town past the famous Hotel Nacional and the Capitolio. Here you will continue on foot to discover Old Havana’s four beautifully renovated colonial plazas and then stop for lunch. Cycle back to the hotel along the Malecon, Havana`s romantic coastal road. Cycling distance 35 km. Night in Hotel. Head west to picturesque Pinar del Rio Province. Starting on the outskirts of Havana, the ride takes you through gorgeous tropical scenery to the “Las Terrazas” Biosphere Reserve. After lunch try the thrilling zipline, or take a refreshing dip in the Rio San Juan. Cycling distance 40 km. Night in the eco resort hotel. Starting in Soroa, cycle along the old Havana-Piñar del Rio road through farmland and charming colonial settlements to San Diego de los Baños. After lunch in this pretty colonial town you will transfer to Piñar del Rio, the capital of Cuba’s cigar country. Enjoy the evening at leisure. Cycling distance 77 km. Night in a hotel or casa. Today explore the best tobacco-growing region in the world. Ride from Pinar del Rio to the farm owned by the Robaina family whose tobacco growing fame led to a line of cigars being given their name. Continue cycling along country roads to a lakeside cattle ranch for a typical Cuban meal. After lunch return to Pinar del Rio by bike or bus before transferring to Viñales, a rural valley many consider the most beautiful in Cuba. Cycling distance 48 km. Dinner and night in a casa particular. Today cycle via the small village of Pons to Cayo Jutias, a 3km-long white sand beach with idyllic turquoise water. Lie back on the sand, bask in the inviting shallows, or discover the cayo’s underwater life on a snorkelling or scuba diving trip (not included and subject to availability). After lunch on the beach soak in more of Cayo Jutias’ delights before transferring back to the casa particular in Viñales for the night. Cycling distance 56 km. Leaving Viñales town in the morning transfer eastwards to Central Cuba (approx. 6 hours). Packed lunch and some stops along the way. No cycling today. Night in hotel in the historic city of Santa Clara. This morning visit the Che Guevara Mausoleum and learn about the Cuban revolution and its legacy. Afterwards drive up to the beautiful Topes de Collantes, a natural park in the mountains above Trinidad de Cuba dotted with magical waterfalls and cool pools. Walk a trail (approx. 2 hours), then after a traditional lunch drive down to the famous colonial town of Trinidad, a UNESCO World Heritage Site and the jewel in Cuba’s patrimonial crown. No cycling today. Night in casa particular. around the cobbled streets, visit some of the town’s many museums and breathe in the special ambiance of this perfectly-preserved colonial market town. Cycling distance 26 km. Night in casa particular. Wave goodbye to Trinidad and ride to Cienfuegos, stopping first for a look around the Botanical gardens just outside the city. Home to Cuba’s Bolero star Benny More, Cienfuegos is renowned for its stylish French architecture and its mini malecon, a seawall that goes all around the city’s bay. Cycling distance 66 km. Night in a casa particular. Transfer from Cienfuegos to the small village of Navarra where today’s ride begins. Cycle through the Zapata Peninsula, a vast marshland home to Cuba’s most important bird species and world-renowned as a Unesco Biosphere Reserve. Stop at Playa Giron, one of the beaches that forces landed on during the 1961 Bay of Pigs invasion, then stop for lunch at a natural sea pool, teeming with tropical fish. Transfer to Playa Larga for the night in a casa particular. Cycling distance 71 km. Transfer to Jaguey Grande for the start of today’s ride through citrus plantations and the small town of Pedro Betancourt to our lunch stop at a charming organic farm that also has its own ceramics workshop. Afterwards transfer to Matanzas, “The City of Bridges”, where the streets span three different rivers. Cycling distance 57 km. Night in a hotel. Get straight on your bike and climb out of Matanzas, heading towards the picturesque Picadura Valley. You might like to stop to snack on fresh tropical fruit in one of the villages along the way. 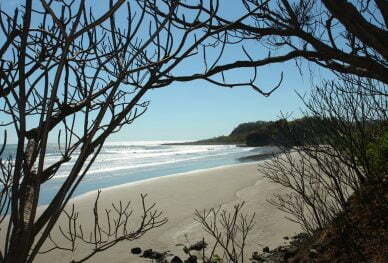 The ride ends at the beautiful Jibacoa beach where there will be a bbq lunch and a refreshing dip in the sea! After a relaxing afternoon at the beach transfer back to Havana in time for a night out. Cycling distance 62 km. Night in a casa particular. Free day in Havana. Explore Old Havana on foot, wander along the famous malecon coastal road or people watch in one of the beautiful colonial squares. Go out tonight to hear some live music. Ask your tour guide for recommendations. No cycling today. Night in casa particular. This morning enjoy a walking tour of Old Havana`s historical centre. In the afternoon transfer (30–40 minutes approx.) to Havana airport. Adios, or, as you may like to think of it, hasta luego, see you later! Have a safe onward journey and come back to Cuba again soon. £1999 per person. Optional single supplement £294. Staff: English-Speaking Cuban tour guide, bus driver, mechanic (day 2 only). Support: 100% vehicle support during rides, 24 hour contact with local office in Cuba. Bike Hire: Trek hybrid mountain bikes. The operator imports all our bikes and have a team of mechanics who keep them in excellent condition. 6 nights in hotels and 8 nights in casas particulares (homestays). You will get the authentic experience of staying in casas particulares in Vinales, Playa Larga, Cienfuegos, Trinidad and Havana. In other locations you will stay in mid-range hotels. All rooms are en suite. Accommodation and service in Cuba can often be more basic than in many other countries. All breakfasts, 11 lunches and 3 dinners are included. Cuba is the land of the mojito, daiquiri, Cuba libre, and of course rum! You’ll find that plenty of good drinks are on offer all over the country with prices ranging from 2-6 CUC for most cocktails. Food isn’t particularly varied in Cuba – expect grilled meats/fish, rice, beans, platano, mangos and tropical fruits. Not a lot of green vegetables though. During this itinerary you`ll go to at least one organic farm offering delicious home-cooked food. Bike and air conditioned bus. 100% vehicle support during cycle rides. This trip requires a moderate level of fitness, having a physical rating by the operator of 7 out of 10. Please get in touch to find out more about what to expect. The route follows roads that are predominantly paved, with small unpaved sections and some pot-holes. Traffic is generally very light. There are some long bus transfers in order to cover large travel distances and allow you to cycle through highlights of the regions. This trip can be tailor made for your perfect travel dates. Please make a booking enquiry for more information. We love this independent Anglo-Cuban travel agency that was founded in 2003 specialising in cycling and interactive cultural adventures with itineraries designed to give travellers a truly authentic Cuban experience. They offer inquisitive, cultured and curious travellers unforgettable trips that help people to discover the real Cuba. We salute their focus on employing predominantly local Cubans to design and implement the trips. The local office staff is comprised of a team of highly qualified and dedicated Cubans, and the guides are all Cuban graduates who share a passion for Cuban culture, nature and the infectious warmth for which the Cuban people are rightfully famous.